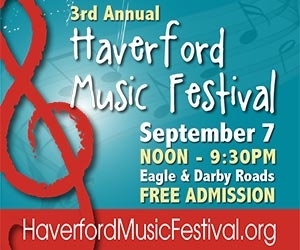 The 3rd Annual Haverford Music Festival once again will come to life in Havertown this Saturday, September 7th. The festival is FREE and open to everyone. There will be 4 stages spread throughout the area around the intersection of Darby and Eagle Roads (which will be open to traffic) featuring more that 40 different musical acts. The music starts at noon and goes until 9:30 pm. A wide variety of genres including rock, pop, singer/songwriter, classical, blues, and more will be covered by musicians/artists from Havertown, the Philadelphia area and beyond. The fourth stage is new this year and hosted at The Rock, a Grace Chapel facility on Eagle Road. There will be an open mic held there from noon to 4pm for anyone who wishes to sign up to take the stage. The Field Stage will be broadcast LIVE by iradiophilly. When you tune in to the live stream you can hear performanes by Willy Potts, Self Indulgence Band, Green Eggs and Jam, Skip Barthold, Milton and the Devils Party, Alex DiMattia, Dylan McGuire, Ashley Leone, Suzie Brown, Cold Son, New Sweden, Meghan Cary, Laura Mann, Stelladeora, Del's Groove. You'll also hear interviews with the artists, event organizers and sponsors. There isn't just a ton of great music happening on Saturday. The streets will be full of great food vendors, beer gardens, craft tables, non-profits, and many local business sponsors. A raffle will be held for target="_blank">great prizes. Entries are only $2. If you buy a raffle wrist band for your child they also get unlimited rides down the giant inflatable slide. All proceeds from the festival benefit the Haverford Township Civic Council and their township projects and programs.